What is the one big thing that prevents you from achieving everything you want in your music career? No, it’s not a lack of natural talent, being too old or living in a non-music city. Self-sabotaging thoughts are the biggest cause of music career failure. There are lots of opportunities in the music industry that are readily available to you as long as you are prepared for them and don’t let fear or self-doubt get in your way. Sometimes these opportunities are right in front of you, but you are afraid to take advantage of them. A common source of all fears in the music business is not having enough time and money to support your music career. Example: You work really hard to release your music and put a band together. Then you get the chance to go on tour and you turn it down because you are afraid of not being able to pay your expenses back home while you are gone. This is a very frustrating situation to be in. When you learn how to make money as a pro musician, many of your fears and self-doubts disappear. You feel more confident because you have freedom to pursue or create your own music career opportunities other musicians only dream about. Want to learn more about earning a great living as a pro musician? Read this article about the biggest music career mistakes to avoid and achieve your musical dreams much faster. 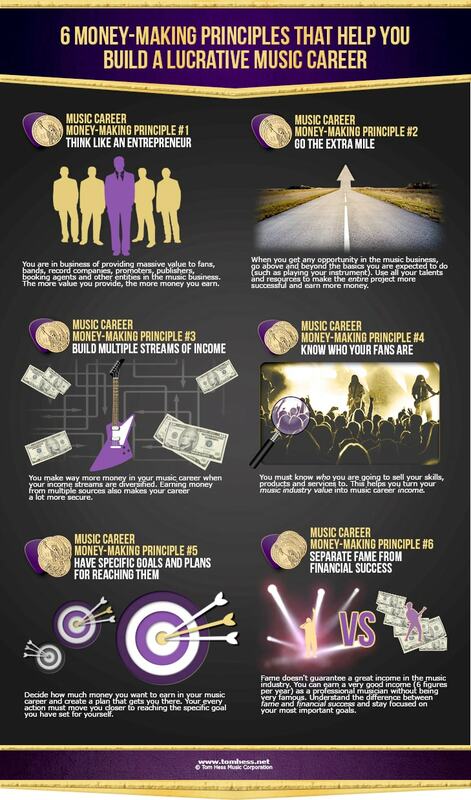 Work together with a successful music career mentor to build your music career success plan.